Endings are hard to write, as the writers of the season finale of both 24 and Heroes have discovered. 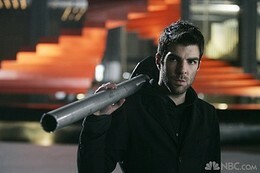 This episode of the show, "How to Stop an Exploding Man," hit the wall walking, and the impending doom of the final big boom fell flat as Sylar, the best villain ever, seems to have forgotten that he has at least a dozen super-powers, and died with barely a whimper. I must say, I'm going to miss this bad guy. Still, since the show features only intermittent logic, it's possible that he'll be resurrected next season. "He could just be a f***ing idiot. Historically, that's been the case." Later in the show, another mobster, Carmine, tells Tony that " after this alteration you had with him, you're at the precipice of an enormous crossroad." It's mixed-metaphor, dialogue like this that makes this show great. I hope these writers have a better grasp on how to write an ending than the ones who mangled the denoument of 24 and Heroes.